Check in time is between 3 PM -5 PM and check out is before 10 AM. An early check-in or late check-out can be coordinated for an additional fee. This must be confirmed by the rental agent and is not guaranteed. In the event of a Sunday check in check in time is 5-7 PM. Due to security reasons, no illegal software, files, movies or music may not be downloaded by guests on any computer, tablet, phone or electronic device. Endless Summer Realty or the owner may not be held liable for any illegal downloads. Neither the owner nor the manager is responsible for injury, lost, or stolen items. PETS ARE ONLY ALLOWED IN APPROVED UNITS AND PET SIZES MUST BE APPROVED. Endless Summer Realty Vacation Rentals reserves the right to enter any property to investigate disturbances, reports of over occupancy, and unreported pets. Stays must be SATURDAY -SATURDAY if you book something different than this your reservation will be canceled. A 50 % reservation payment is required and will be applied to the total amount due. The final payment is due 14 days before your arrival and is non-refundable at that point. The final payment will be billed to your credit card on file unless other payment arrangements have been made. Please note if the 14 day final payment falls on a Saturday, Sunday or a holiday it will be charged the last business day prior to your final payment date. All rates are plus 10.5% tax. There is a one time cleaning fee for each reservation. We accept VISA, MASTERCARD personal & certified checks as well as money orders. There will be a $45 Accidental Damage Insurance & Processing Fee. The Accidental Damage Insurance is a damage waiver that will cover up to $1,500 for accidental or inadvertent damages. Please be advised that intentional damage or gross negligence will result in additional costs, which will be applied to the credit card we have on file. The Processing Fee covers our administrative costs. No changes can be made within 14 days of your arrival. Check out is 10 AM for all properties unless a late check out has been confirmed. Guests who delay checkout beyond 10 AM will be charged for an extra day. DO NOT LEAVE KEYS IN UNIT! Keys are to be returned to the Endless Summer Realty Office or the metal mailbox outside the ESR door. Lost keys and keys not turned in will result in an additional $50 charge. Guests are responsible for removing all food from the refrigerator,loading dirty dishes in the dishwasher and starting it. Guests must also strip the beds and start the first load of laundry. Travel Insurance is available at 6.95% of your total and offered through CSA Travel Protection. Travel Insurance must be purchased prior to your 14 day final payment. Endless Summer Realty Vacation Rentals recommends guests purchase trip insurance if concerned about possible interruption or cancelation of trip. Trip Insurance payment is taken at the time the reservation is processed. For travel insurance coverage information, please contact CSA Travel Protection at 1-866-999-4018 or when calling from abroad please call 1-240-330-1529, reference plan code 330CSA. Your premium will be charged to the credit card on file within 24 hours of the reservation. Our cancelation policy includes a full refund of the rental rate, cleaning fee, and taxes (only exceptions being the processing fee and the CSA damage protection policy) if cancelations are made more than forty-five days prior to arrival. If canceled within thirty days we only refund what we didn't have to pay (cleaning fee, taxes, etc...). If we're able to rent the unit again we'll refund the total minus the difference between the two rentals. 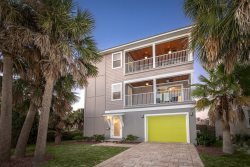 In the unlikely event that the property you reserve becomes unavailable due to circumstances out of the control of Endless Summer Realty Vacation Rentals, or the property is no longer available through Endless Summer Realty Vacation Rentals, we will make every attempt to move your reservation to a comparable property. If a vacation rental property is for sale, the owner reserves the right to have the property shown to potential buyers. Every effort will be made to schedule a time agreeable to the guest. Endless Summer Realty Vacation Rentals does not offer refunds or reschedule trips due to hurricane activity if there is not an evacuation. If you are concerned about possible bad weather, cancelation or delayed travel due to tropical occurrences, you are strongly encouraged to purchase trip insurance at the time of booking (or at least 10 days prior to arrival; trip insurance may not be purchased after final payment has been made). Trip Insurance is 6.95% of your reservation total, and offers a comprehensive cancelation and interruptions policy which can protect you not only in event of weather related storms, but sudden emergencies as well. The peak season for tropical activity is August through October, and Endless Summer Realty Vacation Rentals strongly encourages all guests to purchase trip insurance, especially during these months.